There are many different reasons why an individual will take up a hobby. Some do it to relieve boredom. Others do it for stress relief. No matter what the reason, there are plenty of different hobbies to choose from and many of these are now supported online. One classic hobby that dates back many years is knitting. It used to be that the older generation in families would teach the younger women how to knit. This was a hobby that was passed down from one generation to another. It was not always considered a hobby, as in the old days it was thought of as a necessity. Items would be knitted because there was no other way to get them. Now, people knit mostly because they enjoy it and they like the challenge of being able to produce a finished article based on this level of skill. Now, individuals who want to take up this hobby don’t have to rely on someone being able to teach them who knows how to do it. They can simply go to one of the many online tutorial sites or go to a selection of YouTube videos that are available from beginner to the advanced levels. 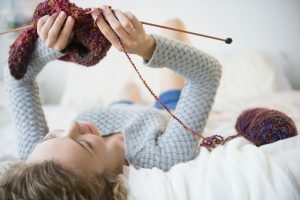 Once one has learned to master all of the different knitting patterns as there are tons of patterns available that they can find online, both for free and for sale. Plus, if they need any knitting supplies then there are plenty of online resources for this also available. Another opportunity one has is selling their finished items in the knitting industry. Most stick with this as a hobby that they enjoy. They soon find themselves with a collection of finished knitted items. What some will do is give these away as gifts, or sometimes they will donate them to charities.